Beauty Editor Agoo Bengzon and Cream Silk teach us how to up our hair game in this video. From the moment you get out of the house to the time you collapse in bed after a hard, stressful day at the office, your hair can take a beating from dust, pollution, heat, and even chemicals. Dry, frizzy, and hard to manage hair isn't a new problem for Cosmo Girls, especially when we're all too busy being awesome in life. But CGs know that more than just being awesome in life, looking your best also shows how much you care for yourself. Beauty Editor Agoo Bengzon knows this all too well. "Working in the beauty industry, I need to look my best at any given time. But of course, there's a lot more to it than stylish clothes and great makeup. At the end of the day, it's about the total package which is why I make sure that everything from my brows to my nails get proper care and attention," she says. Check out Agoo's advice on taking your hair's beauty to the next level in this #BeautyUp video. Your hair can say a lot about you. In fact, experts in face reading suggest that thick, lustrous locks are often associated with being innovative and creative. Shampooing is not enough to make you look like you mean business. To make a statement, you need to level up your daily beauty regimen from your usual wash-and-go look to expertly cared for tresses. Cream Silk has long been a partner in making sure that every Pinay can get smooth, tangle-free, and healthy hair. With products formulated specifically for Filipina hair, the beauty experts at Cream Silk has created a product that ensures you can take your beauty to the next level. The Cream Silk Daily Treatment Conditioner combines the speed of the No.1 conditioner and the nourishing power of the No. 1 treatment in one to make your hair softer, smoother, and easier to manage even on a daily basis. Cream Silk Daily Treatment Conditioner comes in four variants to suit different hair types: Standout Straight, Hair Fall Defense and Damage Control, and Dry Rescue. Take your daily hair regimen to the next level with the No. 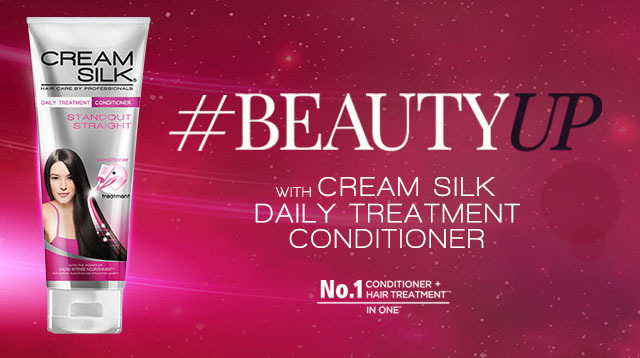 1 hair care brand in the country and #BeautyUp using Cream Silk Daily Treatment Conditioner. Who knows? You might be the lucky girl who'll win a new designer bag from Cream Silk! Check out Creamsilk.com.ph/beauty-up to find out more.